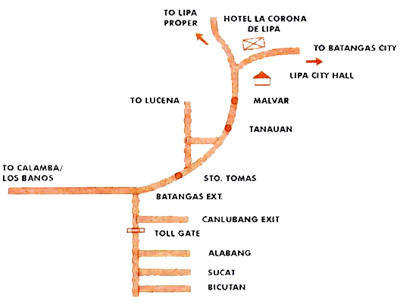 Hotel La Corona de Lipa is just a 90-min. drive from Makati. When you get to Lipa City, you will be greeted by a welcome arch. About 5 Kms. from the arch, you'll pass Lipa City Hall. After about 300 m. you will be at Hotel La Corona De Lipa (It's on your right after the junction going to Batangas).